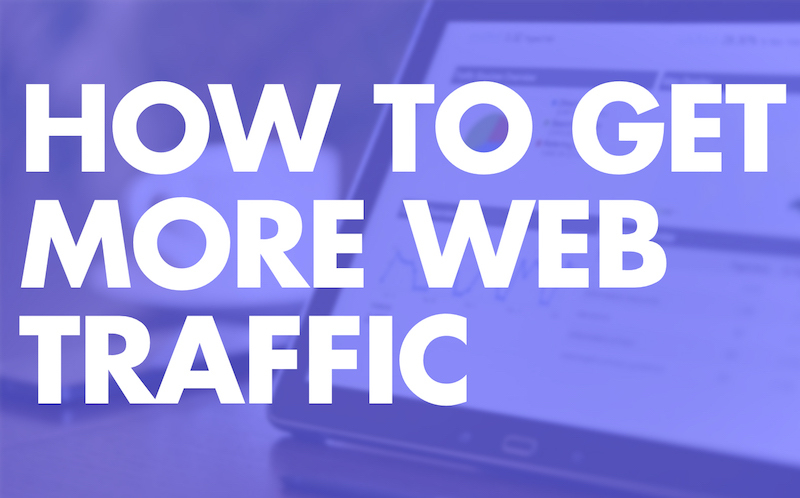 Figuring out how to get more traffic to your website (or to your business) can be a bit of a daunting task. There are so many options, right? So most entrepreneurs just say, “Screw it,” and start throwing everything at the wall that is the internet, hoping something sticks. Let’s fix this problem today. A few weeks ago, I covered the four things you needed to build a six-figure business. Today I want to focus on #1: getting web traffic. This question kind of freaks out a lot of people because they see all these different avenues of getting it and they get overwhelmed. “Should I use Google? Should I try Facebook? Should I post on Reddit and hope and pray people click through? Maybe radio or TV ads? You get overwhelmed and BECAUSE you’re overwhelmed… you don’t get started. Or maybe you pick a channel and go deep into the rabbit hole with it, and before you know it, you’re more confused now then you were at the start. Whichever problem you have (how to get web traffic or how to use certain channels to get web traffic), I want to solve those problems for you here and now. Building your web traffic numbers is your first step in building your online business. Without getting eyeballs on your website or bodies in your store, the other three components mentioned above don’t even matter. That’s it and that’s all. Two ways. Don’t get any simpler than that, right? Once you understand that- the two high-level views of web traffic- you can start breaking it down into simple steps. Free traffic is any tactic that doesn’t cost money to get more people to visit your site. The downside of free traffic is that it usually takes some time. Paid traffic is any tactic that costs money to get more people to visit your site. The downside of paid traffic is that it costs, BUT… it usually saves you a lot of time. To plan your traffic strategy, take all those avenues in paid and free traffic… and pick one of each. One Paid Traffic source (like “Facebook ads”) and one Free Traffic avenue (like “Interviews on podcasts/YouTube”). What this does is allow you to spend your time (or money) focusing on going deep and really mastering one channel. So with paid traffic, you’re not spreading your budget thin by going 20% deep on 5 channels. You’re spending 100% of your budget on ONE channel and taking time to master it. With free traffic, you’re not just trying everything under the sun hoping to get a little PR- you’re focusing and concentrating your efforts on ONE thing. Trying to get on industry podcasts. Trying to get featured in certain magazines. Getting interviewed by popular YouTubers in your niche. This also allows you to create templates and shortcuts to cut down on time spent with outreach. So if you’re focusing on JUST getting interviewed on podcasts, you can craft a single ‘podcast pitch’ email and just change the email address and a few lines (to make it sound personal) and send it off. WHICH WEB TRAFFIC SOURCE SHOULD YOU PICK? We now have the high-level strategy (focusing on ONE paid traffic source and ONE free traffic source), but how do you narrow that down? How do you know which individual traffic source to pick? WHAT DOES YOUR BUSINESS NEED THE MOST? Do you need “just traffic”… or do you need things like testimonials, credibility/authority, or high-quality leads? The answer to that question will help dictate which traffic sources you should focus on. For example, maybe you’re a newly-formed graphic design company, and not getting any website visitors. But since you’re new, it’ll probably be awhile before you can climb the search engine results pages, so you need quick credibility so people INTENTIONALLY seek you out (vs stumbling across you on a Google search). In that case, it would serve you well to get interviewed on podcasts/YouTube channels/local magazines. It’s quick exposure, you can provide great insights to a targeted audience, and you become the benefactor of the “Featured Effect”- meaning you automatically increase your credibility and authority because you were featured in a publication. People assume that since that publication took time and effort to interview you, you must be worth listening to. On the other hand, if you’re already fairly established and have a solid reputation, you might just need some fresh prospects and leads, so paid traffic in your local market (to people who haven’t heard of you) will get you the quickest results. I’m convinced that most businesses owners have a first instinct about where they should turn to first for their traffic sources, especially with paid advertising. Don’t ignore that first inkling! If the moment you hear “paid traffic sources” you think of “LinkedIn ads”- trust that. Spend 15 minutes reading about that platform and what it can do for you, and see if it makes sense. Remember, you can always change it later on if it doesn’t get you any results. If you don’t have a few thousand dollars a month to spend on Facebook ads, then you can cross that off the list. However, you might have $300-500/month, and that could get you some influencer shoutouts/paid features on a popular channel, and could be money well-spent. Whatever budget you have, cross off all other paid traffic sources that are OVER budget… or really far under budget. You’re trying to find a balance between value and exposure. WHAT IF YOU PICK WRONG? Marketing can be like the stock market- all signs may seem point to a good investment… but you can still pick a dud. Marketing a business is about experimenting- making an educated guess and then testing it out. If you try LinkedIn ads and they don’t give you a positive ROI, you might lose a little money, but at least you KNOW that’s not a good source and you can cross it off your list (and can cross off similar sources while you’re at it). Sooner than later, you will find the two sources that give you the most bang for your marketing buck, and you can dive into those and scale up. Facebook ads are crazy- you can target your ads to potential prospects based on all kinds of things like their net worth, people who have visited your website, your current customers, and so on. You can also use the feedback you get from the ads to narrow down your customer avatar and get more specific with your targeting. If you’re working with a bare-bones budget, start here and use your time instead to craft a compelling story, then reach out to publications with that pitch, whether it’s a popular podcast or your local newspaper. Remember, they’re always looking for more content, so if you can provide value to their targeted audience, you stand a good chance to get your story picked up. Spend 1-2 weeks interacting with one YouTube channel, one podcast, and one blog. Pick ones that your target customer consumes, and after spending a few weeks building a relationship, reach out. There you have it- where to start getting more web traffic, and how to narrow it down so it’s not overwhelming. Pick one free traffic source and one paid, then go deep on those channels and test them out. What are your favorite traffic sources? Did I miss any here?